Vole O'Speed: Are cyclists allowed in the Games Lanes or not? These lanes, which will be clearly marked, will only be open for accredited vehicles and on-call emergency vehicles. They will typically operate between 06:00 and midnight, and only be used on multi-lane roads so there will always be at least one lane for general traffic. You could receive a Penalty Charge Notice if you drive in a Games Lane if you are not an accredited vehicle. It's so like TfL to word a statement as if the only people entitled to use the road are driving, not riding – it shows how they really think about the roads. When, however, a recent LCC borough group newsletter went to press, with an item warning cyclists, in passing, that they would not be allowed to cycle in the Games Lanes, a council officer closely connected with the Olympic preparations contacted the group co-ordinator in question to say that this was wrong, that cyclists could use the lanes. When read out the paragraph above, that I have quoted from the TfL website, he stated that it was "misleading", and that he would ask TfL to correct it. I have done some further study of the detailed documents on the TfL site describing the Games Lanes. There are diagrams for every borough. For example, this diagram covers part of Camden including Euston Road, and the Upper Woburn Place to Kingsway corridor. 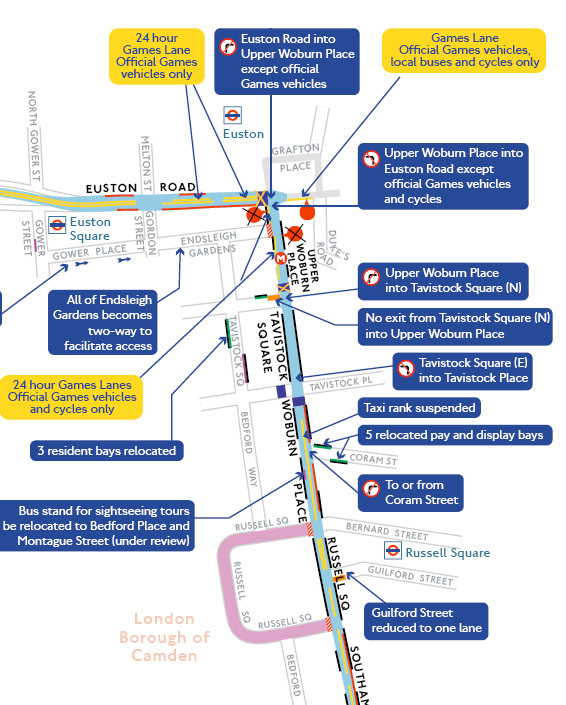 It shows clearly that the Games Lanes in Euston Road are the inside lanes, and that they are for "Official Games vehicles only". (But could a bike be an Official Games vehicle? I leave that question hanging in the air.) However, the lanes on the north-south corridor are all over the place on the road, they are very fragmentary, and the northernmost section, in Upper Woburn Place, is marked "Official Games vehicles and cycles only". Does this yellow caption bubble apply to all the bits of yellow lane down this corridor? This is unclear to me. But another fragment on Euston Road is marked similarly. The thing that strikes me about these plans is that, leaving aside the rights and wrongs of the whole thing, not only is TfL incapable of conceiving of continuous, effective bike lanes, or bus lanes, as we know from long experience, it has proved no more capable of imagining continuity when told by the IOC to create this network. How one earth are they expecting this itsy-bitsiness to work in practice? Who is going to enforce it, bearing in mind the negligible level of enforcement there is of all other painted carriageway demarcations, e.g. cycle stop boxes and hatched junction boxes? Who is going to understand this complexity, with some Games Lanes being 24 hour, some not, and some allowing cycling, some not? Is this really policeable? It looks like a classic British fudge. I wonder what the IOC will think when they see it. I also wonder how much of the time Official Games vehicles will actually be using these lanes, and how many of them there will be. If cyclists really are to be permitted in some of these lanes, or all of them, as the council officer seems to believe, then, with the numbers of cyclists there are in London already, combined with a special upsurge for the games, combined with the fact that cyclists have few dedicated lanes of their own, maybe cyclists will prove to be the dominant users of these lanes. Maybe these lanes will provide the real "cycling superhighways" to the games, and to elsewhere, that TfL so conspicuously has not provided under its actual Cycle Superhighway programme. What will the IOC think of that? It would seem that, as a generalisation, Games lanes in the centre of the carriageway are for Olympic vehicles only; and that Games lanes on the kerbside lanes replacing existing bus lanes are permitted for (certain) bus lane users as well as Olympic vehicles. So yes, TfL is confused & confusing as usual. What a complete load of arse. Enforcement requires 'offenders' to be reasonably aware they were not allowed to do something. TFL make cursory reference to 'drivers' here and there but provide no real explanation... There must be a hundred little alteratinos here there and everywhere on my commute in... Well done TFL on another job done badly.